Pesticide Impacted Soils – Pilot Testing for Technology Comparison - Noreas Inc.
NOREAS directed a multidisciplinary team of scientists and engineers on the pilot scale treatability study at the Stuart Mesa Agricultural Fields (SMEAF) at Marine Corps Base, Camp Pendleton. Soils at SMEAF have been impacted by pesticides from past agricultural activities (tomatoes), including toxaphene, dieldrin, and various other chemicals. Over 350 acres of soil were impacted, at depths ranging from 6 inches to approximately 18 inches. NOREAS designed a site-specific pilot test to evaluate the feasibility of three approaches to remediation, including two ex situ bioremediation-based products and an ex situ chemical oxidation process. 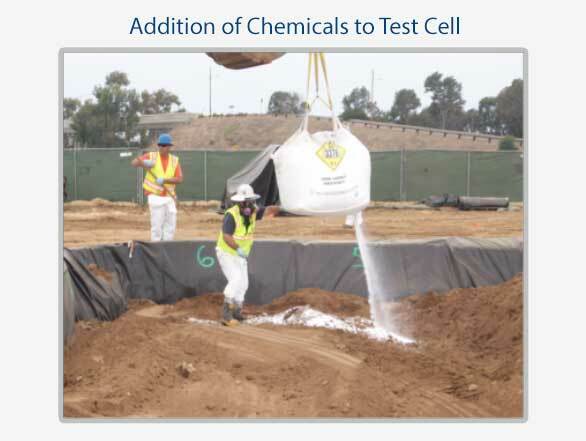 A total of six test cell plots were managed, including three treatment-test cells and three experimental control cells containing approximately 150 cubic yards of impacted soils per cell.